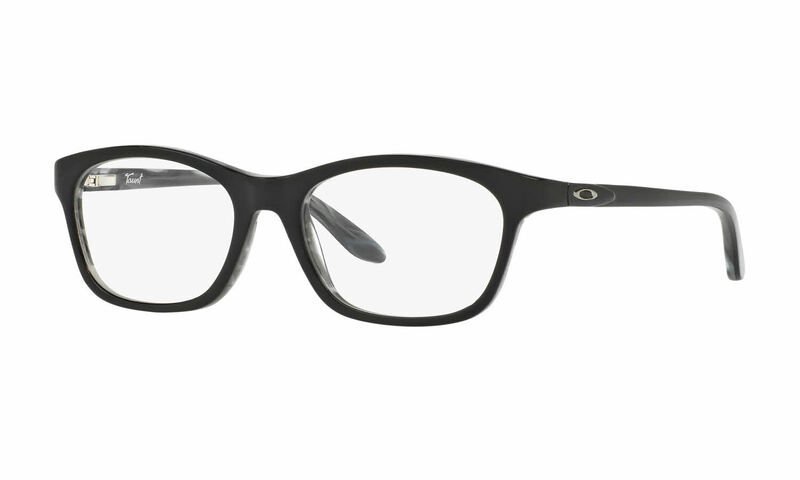 Oakley while still being a leading manufacturer of sports eyewear, also has created lines of eyeglasses that are ready-to-wear and for everyday use. The Oakley brand is universally recognized and is synonymous with innovative, quality craftsmanship. Taunt Eyeglasses by Oakely are for the fashion forward woman that wants to look trendy, hipster, and stylish in the office and at the gym. Frames are made from Acetate, a lightweight material that is perfect for full colors and patterns. Oakley Taunt feature a Full Rim, Square frame front. Oakley glasses are put through a three-point fit system that ensures your lenses will fit appropriately. Taunt frames feature the signature Oakley “O” on both temples. These frames flatter more oval or round faces. Each frame in this Oakley collection has a jewel-toned fade in the center frame that is unique to each pair. Spring hinges are featured on these frames which minimize future adjustments and make your glasses more comfortable. Taunt frames come in a variety of colors and patterns. Oakley Taunt Eyeglasses come with an Oakley protective carrying case and cleaning cloth. I always get these. They are great! Everything got here quickly and correctly.